A group of children become enchanted by a thin, mysterious tower that stretches endlessly into the sky from an island in the nearby ocean–and they promise one another that someday they’ll travel there in an airplane they’re building together. I am tempted to refer to Shinkai as the Terrence Malick of Japanese animation, as this slow and nostalgic film is bolstered throughout by thoughtful pacing, beautiful music, and gorgeous animated montage sequences. Even if the viewing is hindered by the minor distraction of subtitles, the film’s sheer artistry makes it well worth watching. What can I say about Sita Sings the Blues? It is hilarious, quirky to the point of bizarre, delightfully animated in a number of styles, and utterly entertaining. My only criticism is that it’s a little too far on the “girl power” side of the street for my anti-feminist tastes. Still, it more than makes up for that one tiny lacking. From the silhouette narrators who quibble over minute details of this traditional Indian tale, to the bubbly and exaggerated music montages set to the gorgeous voice of Annette Hanshaw singing classic American jazz and blues tunes, to the sloppy and sad Sunday-paper-cartoon-like style of the director’s own autobiographical sequences, this film has a breadth of artistry and interest quite impressive in any animated film. While not kid-friendly, it’ll bring out the childlike side in anyone, and it’ll be sure to fill a few hours with laughter and music and fun. Everyone loves Miyazaki. There is, first of all, the advantage that most (if not all) of his films have been translated and dubbed into English–with the added bonus of quite excellent voice acting. His fantastical, whimsical, loveable style is (for the most part) cozy and innocent enough for children while remaining full and interesting enough for adults as well. 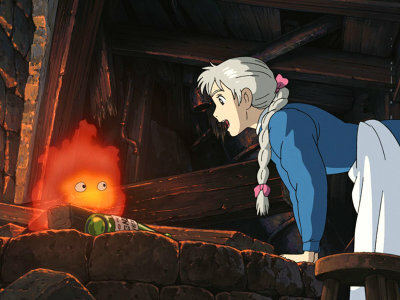 While I could really recommend here anything from Kiki’s Delivery Service, to Whisper of the Heart, to My Neighbor Totoro, to Ponyo, my very favorite Miyazaki film is undoubtedly Howl’s Moving Castle. 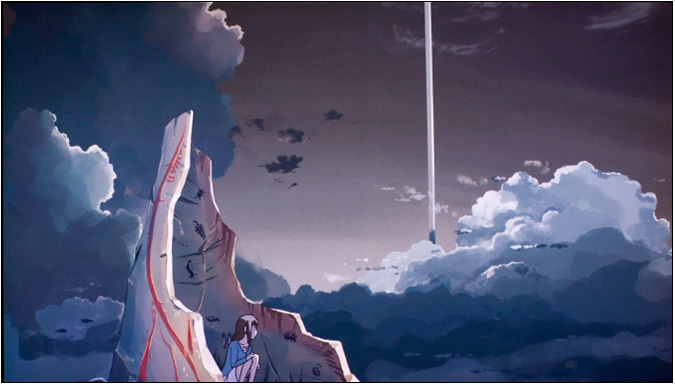 (This could change soon – see my page on Miyazaki Mondays!) Sophie is perhaps one of the most endearing and sensible female characters I’ve encountered in any animation, not being laden down by the characteristically annoying and airheaded temperaments of most anime heroines. And the supporting cast of bizarre and adorable characters creates a delightful tale, with, perhaps, even some genuine depth. This silhouette film is a combination of vignettes, each of which contains a short fairy tale about (of course) princes and princesses. While the tales themselves are interesting, witty, and imaginative, the true greatness of this film lies in the animation itself. Watching each gorgeous and detailed silhouette take shape is a great delight, and the sharp yet subtle style of French animation creates a wonderfully enjoyable show. In a dark and dreary clay-mation world, little Mary from Australia and middle-aged American Max are happenstance pen-pals. This account of their correspondence is at once delightfully irreverent, awkwardly innocent, and strangely sad. From the wry narration to the exaggerated style, the film creates a distant yet relatable world within which odd friendships can create meaningful changes and lasting hope, even in times of disillusionment and despair. True to its Celtic heritage and to the illuminated manuscript from which it takes its name, The Secret of Kells is one of the most intricately animated films I’ve seen. The beauty of the animation is well matched by the beauty of the story, told in the hauntingly mysterious world of the Celtic past. The dark, fiery foes, the quaint, walled-in villages, and the lush, ominous forests full of spirits and wolves call forth questions of safety, creativity, mystery, and hope as we learn that walls alone aren’t strong enough to defend against life’s greatest enemies. An elderly couple living in the English countryside hears news of wars and threats of bombings. They arm themselves with governmental pamphlets, bunkering down behind a matress against a wall, ready to do their patriotic duty and trusting wholly in the powers-that-be for safety and rescue. They are disappointed. Against the backdrop of David Bowie singing a strange song across the opening credits, the mish-mash of 80’s animation styles, and the strange soundlessness of the silent narrative, broken only by the elderly couple’s occasional dialogue and final broken prayers, When the Wind Blows is perhaps one of the most oddly, quietly disquieting films I’ve seen. Roald Dahl + Wes Anderson + Animation = a quirky, subdued, rich, amusing film. From the deftly employed “cuss”-ing to the dry, sarcastic voice acting, Fantastic Mr. Fox‘s conquest of the respective farms of Boggis, Bunce, and Bean is translated beautifully into film. 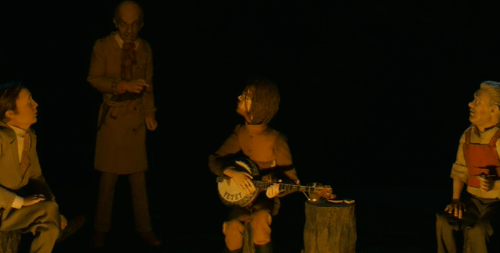 Just as delightful is the fun and fitting music, highlighted by the children’s creepy sing-song rhyme and Petey’s impromptu ballad for Mr. Fox. Not a children’s movie by a long shot, Tokyo Godfathers follows a group of homeless folk who stumble across an abandoned baby in a trash heap while rummaging for goods. In their search for the child’s family, an embittered old bum, a homeless transvestite, and a runaway teenager create a wealth of irreverent hilarity and discover familiarity even amongst squalor and discontent. It is difficult to describe exactly what makes this film great–what could’ve been cliched, oversentimental, and dull is somehow communicated masterfully and meaningfully. An elderly actress grants one final interview to a long-time fan, and through a series of innovative flashbacks and rambling remembrances, she relates her story of sadness, resignation, and loss. A brother and sister are left without family, living alone in a little hovel during a time of war. This stunningly animated film is at once gorgeous and devastating. The nauseous horrors of war and its ravaging of the Japanese countryside are highlighted, yet only in the background of what is truly a story of genuine love in the midst of hardship, of joy in the midst of pain, and of hope in the midst of loss. 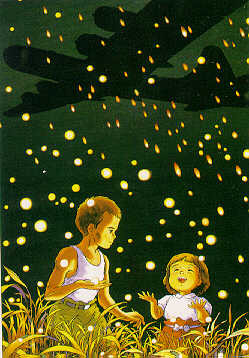 Grave of the Fireflies is truly a masterpiece.